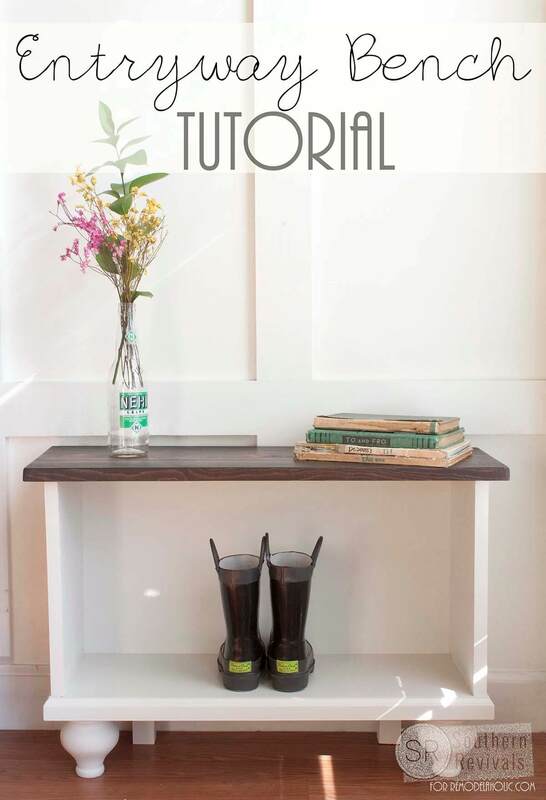 If your cluttered entryway has become a dumping ground for shoes, coats, and other miscellaneous items then these DIY entryway bench projects may help you become more organized and can help streamline your morning routine. Your doorway is not only the first thing visitors to your home will see, but it is often the hub of morning activity in a home. It is an overlooked and underutilized space. Even if you have only a small area near your front door, a simple storage bench can help keep clutter out of sight and will provide a welcome place to sit down and remove muddy shoes and boots. 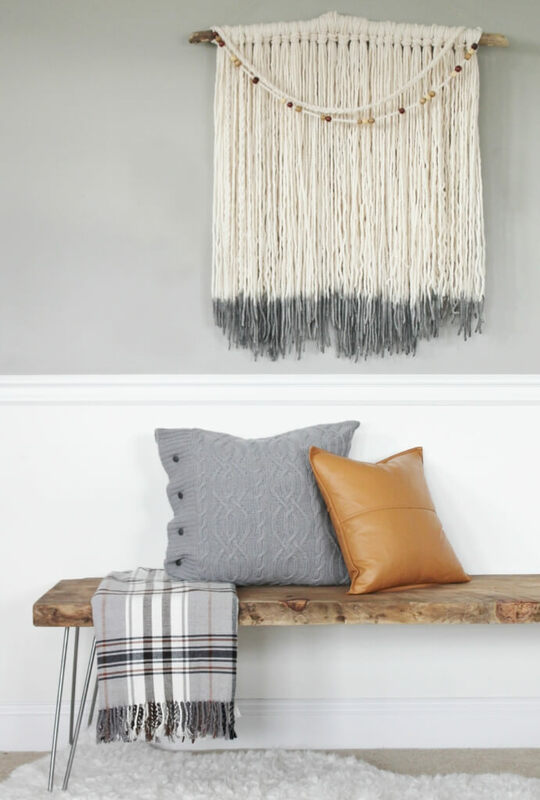 The kind of entryway bench you need will largely depend on the size of your family and the kinds of equipment you will need to keep by the door. If you have several children or if you live in an area with heavy snow or rain, then a larger project that includes plenty of storage will be best. On the other hand, if you are willing and able to sacrifice some storage room, a simple wooden plank bench may suit your home’s style better. 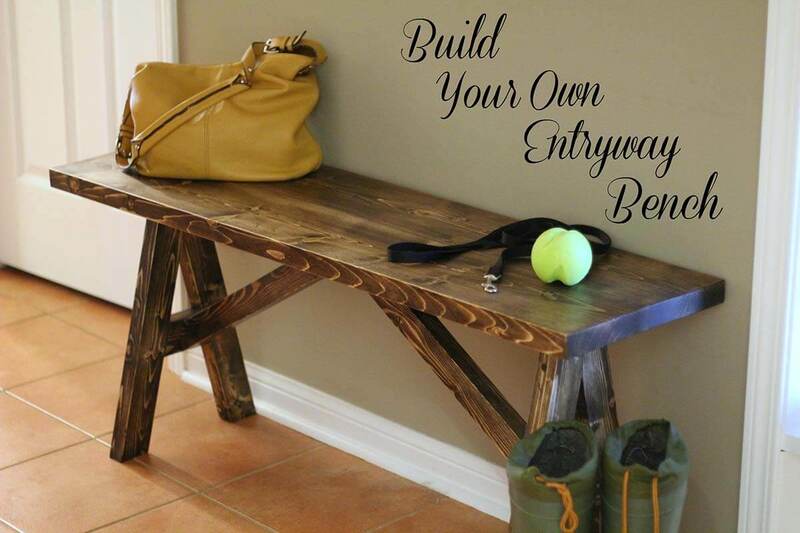 The 25 DIY entryway bench projects below should offer you plenty of inspiration and should help you pick the best bench for your home. 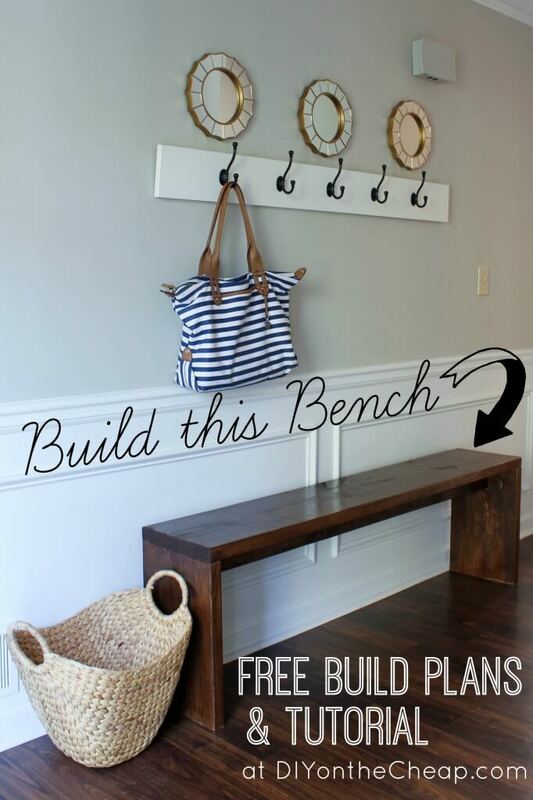 This is an easy way to create a fun storage bench. Your family members can stash their belongings in the bins underneath and the cushioned top adds extra seating as well. You could use this adorable bench in an entryway to store winter hats and gloves, or perhaps in a bedroom for a reading area. This is a great way to upcycle a headboard that you are no longer using in the bedroom. The headboard bench will look perfect in an entryway, or you could use it for outdoor seating on a covered porch. This bench also adds valuable storage space with the wicker baskets underneath. You can always find a free dresser in the classified ads, and now you have a reason to pick one up. With a little work, you could create this sleek bench with drawers. A new coat of glossy paint and a plush cushion complete the look of this unique bench. Home remodeling sometimes results in building materials to dispose of. 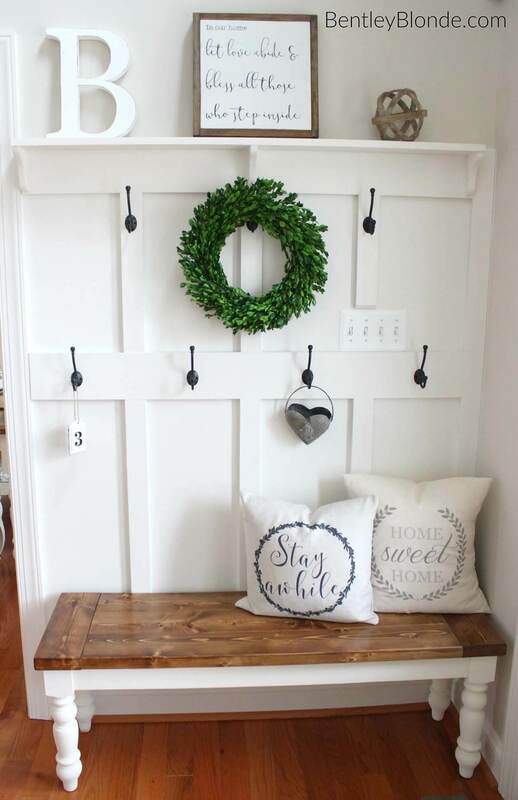 If you replace an old door, instead of bringing the door to the landfill, create something wonderful like this door coat rack! 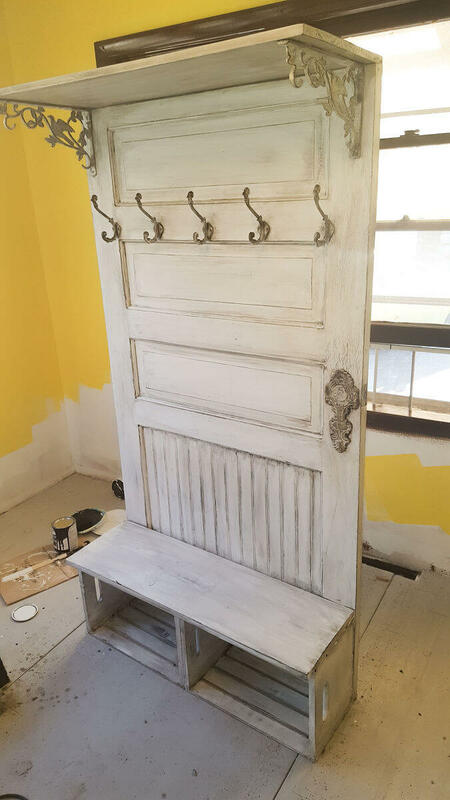 Giving the door a fun paint treatment and adding functional coat hooks will make this the talk among your guests. 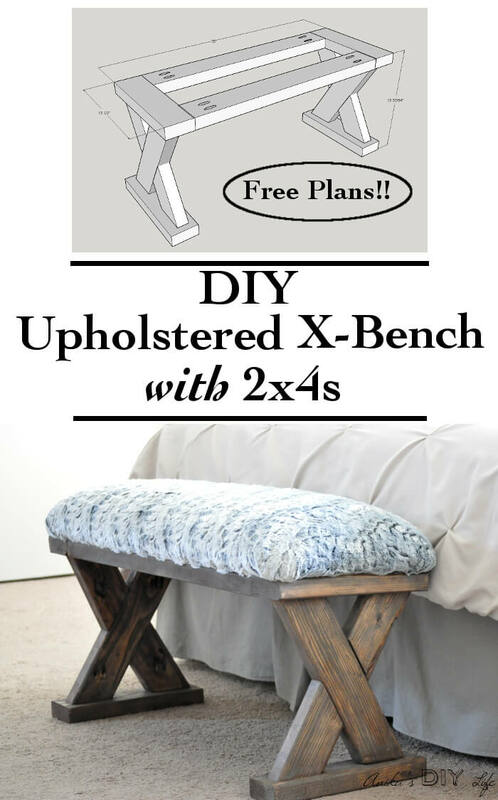 This 2×4 bench with an upholstered seat is easy to create with the included building plans. This particular bench has been stained a dark color, but you could easily adapt this project to use any type of paint or wood finish that you like the best. While this project does not offer additional storage, it is a perfect place for extra blankets in a bedroom. This sleek bench seat stained a dark color and its sleek lines make it a great fit for small spaces such as busy entryways. You can use this cute bench for a spot to rest while you put on your shoes, or perhaps to lay your purse or children’s backpacks on during busy mornings. The white rustic bench with a tufted cushion has unique pedestal legs, making it a conversation piece for your home. This bench would look adorable in a Victorian style home or a teenage girl’s room. This bench can be easily adapted to any décor style by simply switching the paint colors and fabric for the cushion. 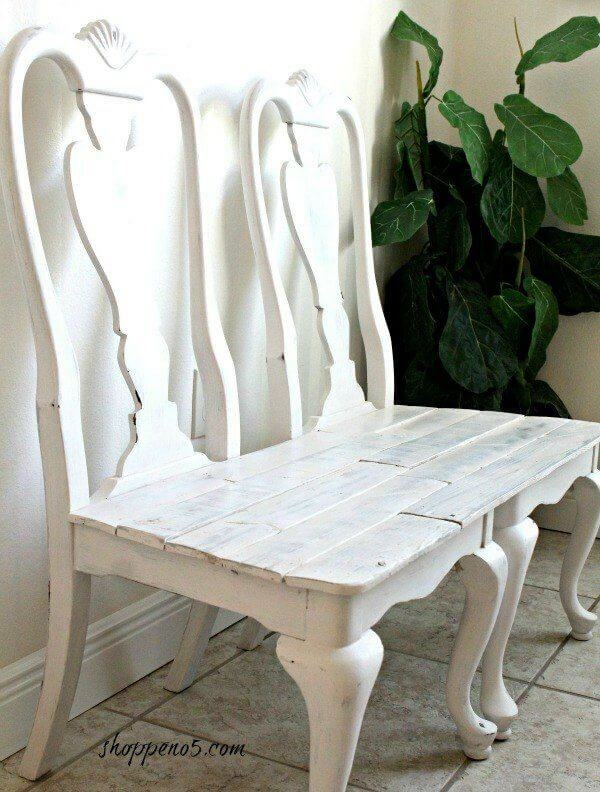 Old wooden chairs are easy to find at rummage sales, and now you have a reason to purchase them with this plan for a shabby chic chair bench. This bench is simple to create and will add style and flair to your home. Upcycling items instead of adding to landfills is very popular right now, and this bench makes great use of this trend. 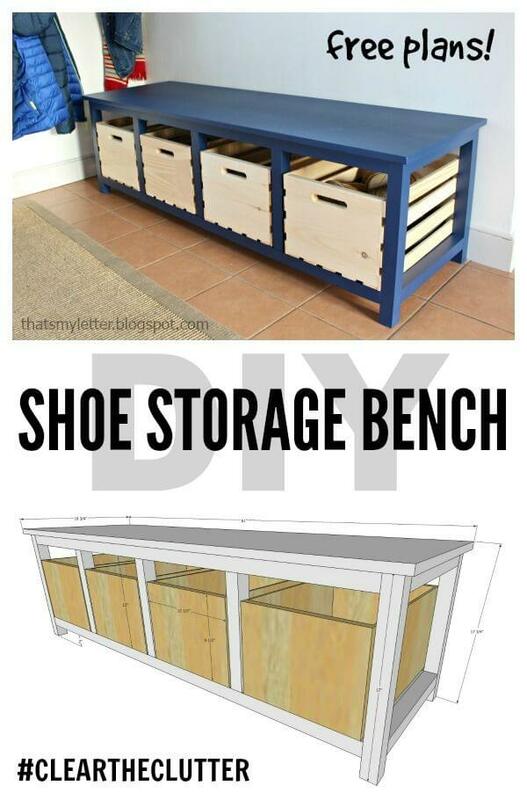 The shoe storage bench is a great way to clear the clutter in your home. The wooden crates beneath the seat will help you stash all types of items so they are out of sight. This durable bench will withstand a great deal of wear, making it a long-lasting addition to your home. If you have seen entryway cubbies and admired them, this is the time to build one for your own home. This version has storage bins underneath the bench, hooks to hang up coats, and backpacks on top. 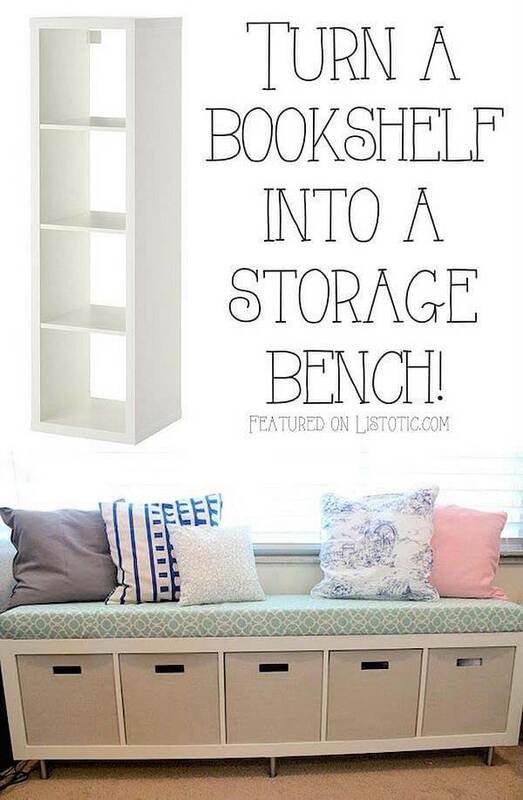 Add a decorative pillow or two and a wall quote, and you have functional and beautiful storage space. This storage bench allows you to have space for a wicker basket and two open shelves for shoes or other frequently used items. The modern gray and white stripes fit well in any decor or home style. This is a great choice for a home that does not have space for a larger entryway bench. The rustic bench has been built from inexpensive pieces of wood that are then finished with stain and a polyurethane to seal the finish. 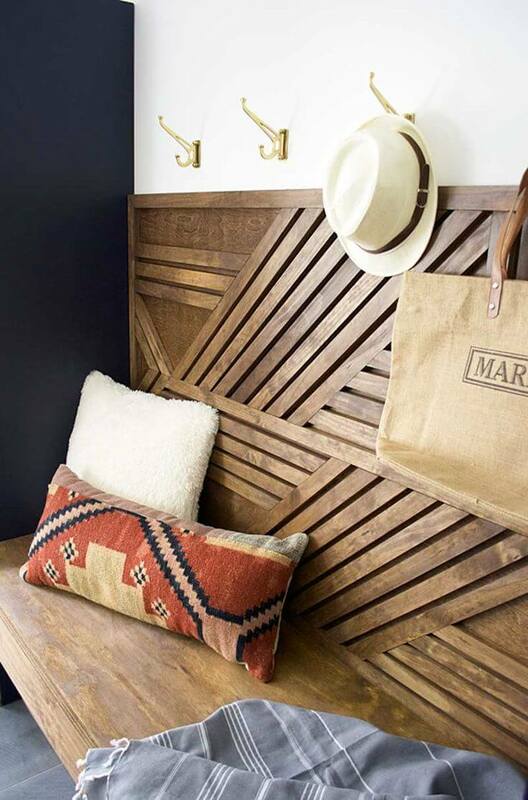 This bench adds a rustic appeal to any corner of your home. You can use this outdoors on a porch, a mudroom, or anywhere else, you need extra seating. With its unique ball-shaped legs, the entryway bench fits perfectly in small spaces. The clean white finish and dark wood top lend a modern flair anywhere you need to update your home. While this bench is meant for an entryway, it would look perfect anywhere you decide to put it in your house. This turquoise bench was formally a nondescript dresser. After a little handiwork with common tools, it is now a conversation piece. Four drawers remain for storage areas while a comfortable bench is included for lounging on during the day. With its eclectic color scheme, this would be a fun bench for an apartment in the city. This bench is upholstered with geometrically patterned cushions on the seat and back and finished with a glossy white paint. These details will help make this the most sought-after seating area in your home. Four cubbies underneath will help catch the clutter and organize shoes. 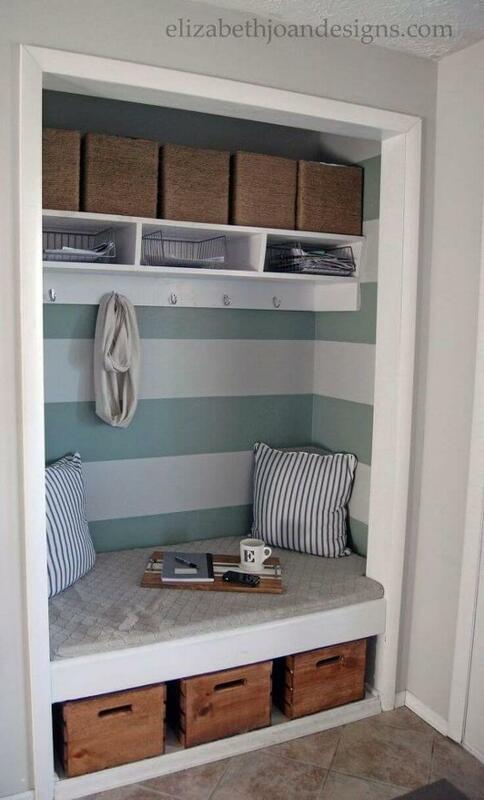 If you need more storage space, consider converting an entryway closet to a bench and storage combination. 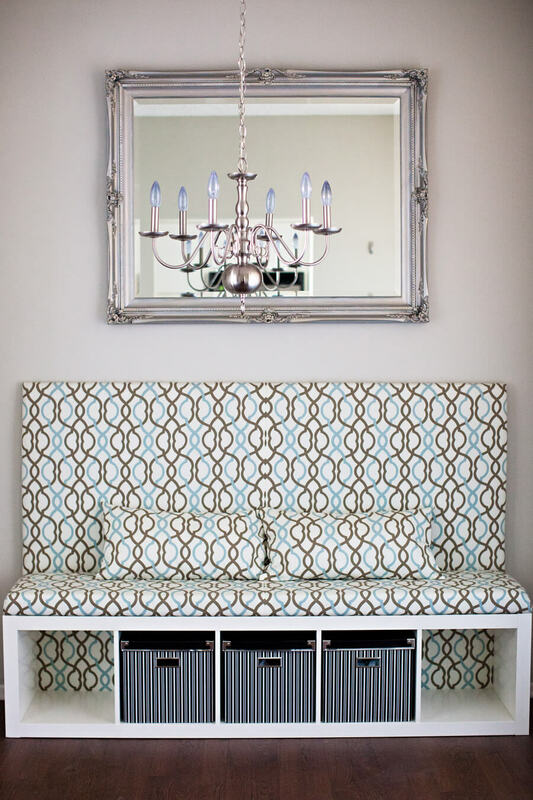 By removing the doors and adding a bench, you have built-in storage that will add value to your home. Adding hooks and baskets will help complete this look while making this functional to your home storage needs. 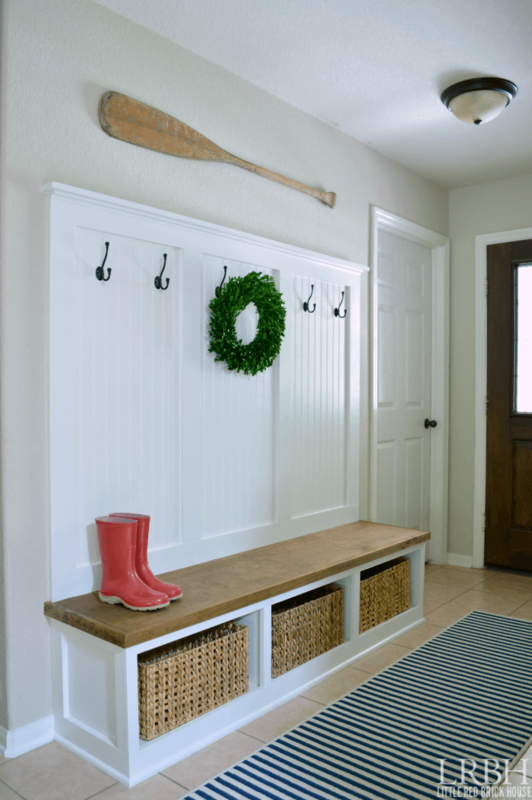 The French farmhouse coat rack and bench is another option for entryway storage. This bench brings in the classic look of painted white wood with functional metal coat hooks. There is plenty of space in this coat rack to add decorative accents as well. You are sure to receive plenty of compliments from this coat rack and bench. 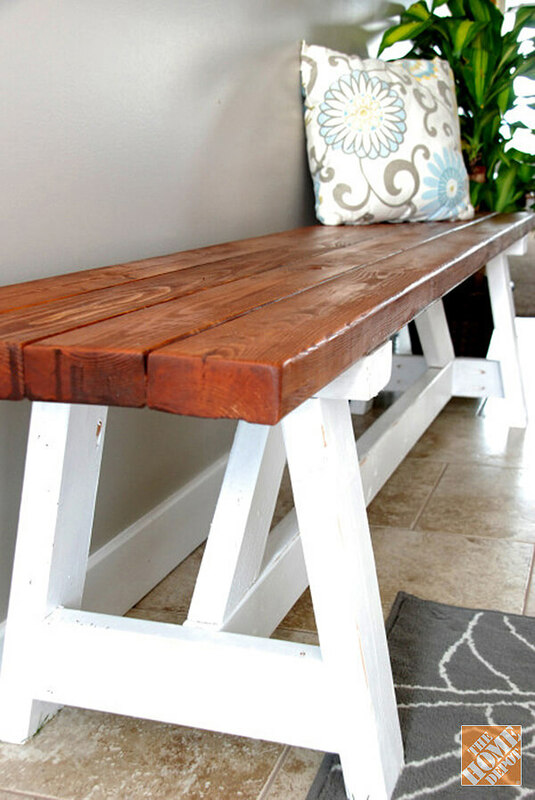 The rustic sawhorse bench is an easy way to add functionality to your entryway. This bench does not take up much space and is perfect for stashing sports gear or children’s backpacks. While it may be smaller than some entryway benches, it is high on style and function. 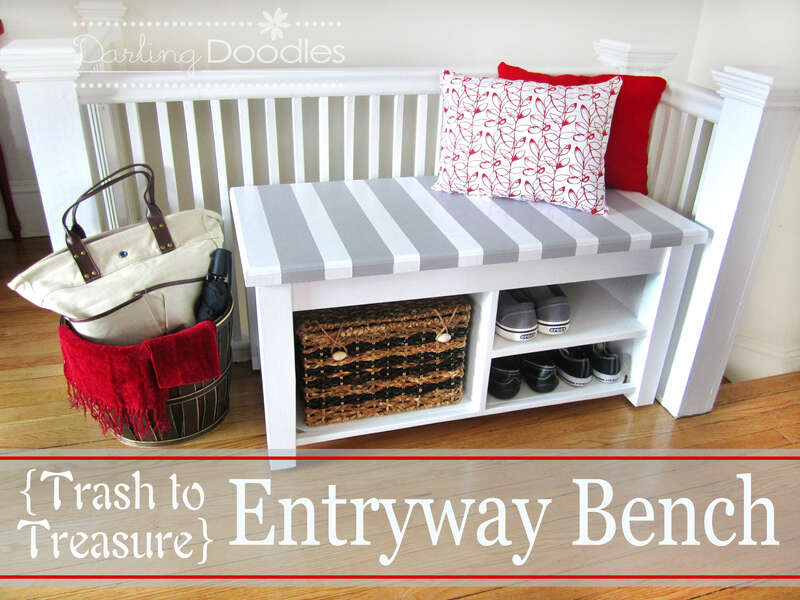 If you have a larger entryway, you might want to consider this entry bench. This boasts a large seating area, wicker baskets for storage, and hooks for hanging coats, purses, or backpacks. This minimalist wooden bench is easy to create. This basic bench does not offer extra storage e but looks great placed against a wall in your home. This bench would be a great fit for a rustic cabin or a farmhouse style house. The geometric bench brings eye appeal to your home when you choose to add this to your decor. The smooth wood bench is offset with the details of the patterned back of the bench. All you need to do is add a few decorative throw pillows and this would be a perfect addition to your home. 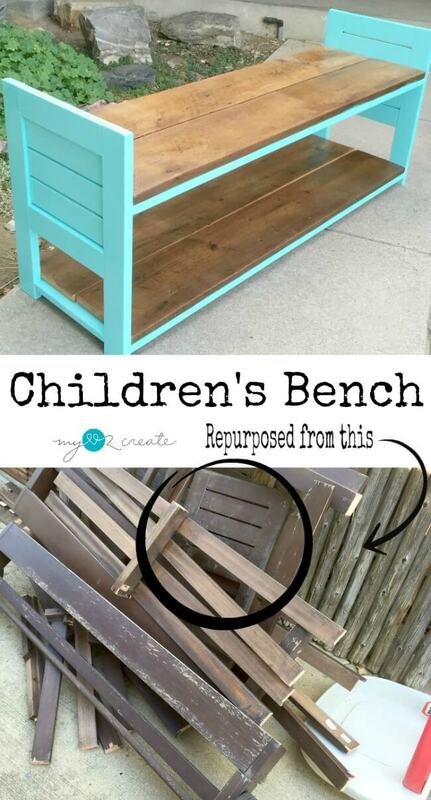 Children need their own child-sized bench as well! 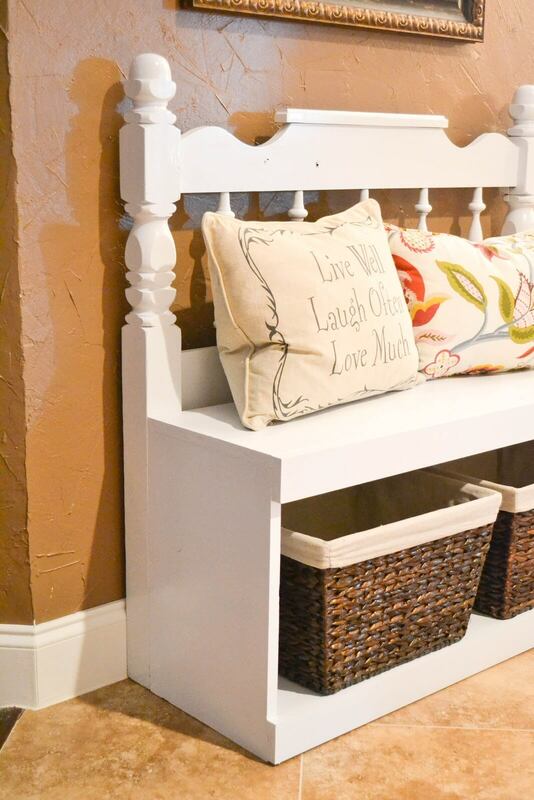 With a little scrap wood and fun paint colors, you are on your way to creating this adorable bench. A bottom shelf to place favorite toys complete the look of this bench. The modern wood bench is another design that would look wonderful in an industrial decorated home. With the metal legs and plank wood bench, this is a simple, yet beautiful design. 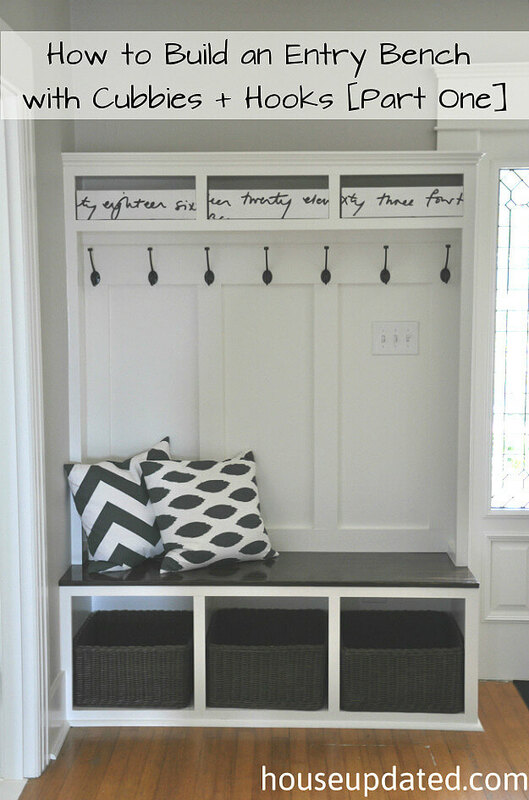 This entryway bench does not take a lot of space, which makes it a great choice for smaller entryways. This bench requires basic carpentry skills and a few pieces of lumber. Add in a splash of color from the paint and a beautifully stained seat, and you will have a bench that you will admire forever. This sturdy bench has a lower shelf for storage.